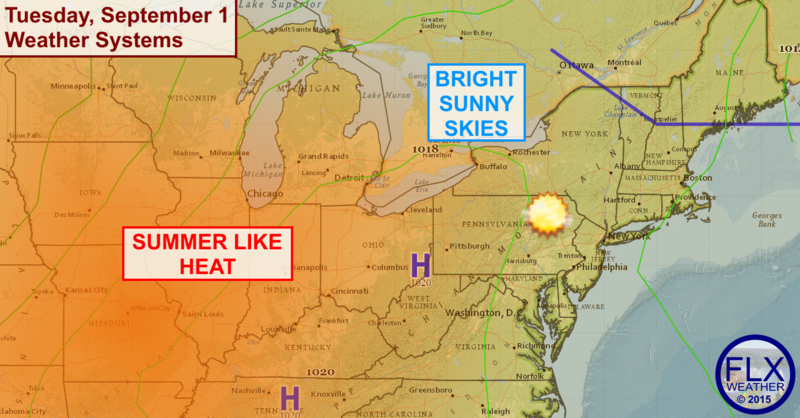 September will start out summery, with temperatures well into the 80s most of the week. A large area of high pressure along the spine of the Appalachian Mountains is bringing summer like heat and humidity to the eastern two-thirds of the United States. The Finger Lakes are no exception to this, as we open September in the midst of one of a warm, dry weather pattern. Compared to the last few days, Tuesday will be hotter, dryer and sunnier across the Finger Lakes. In fact, it may end up begin difficult to even spot much in the way of cloud cover today. Under the bright sunny skies, temperatures should easily push into the mid 80s for many locations. There should be more of the same on Wednesday, though with a few more clouds. Temperatures should again be at least in the mid 80s. Our next shot at some rain will come in on Thursday as a front drops through from the north. Scattered showers and thunderstorms will be likely, though the extent of the rain is still a bit uncertain. Temperatures will not drop much behind the front, with highs near 80º on Thursday and Friday before returning to the mid 80s for the weekend.